We all have manufacturer speed & feed charts and have used their recommendations. But sometimes those charts just don't apply. For example manufacturer charts assume you are using their endmills at a certain stickout length, flute length and at a certain depth of cut. But in the real life you rarely match all these conditions. Sometimes you need to use longer endmill. Sometimes your flute is longer than what manufacturer gave you speeds and feed for. What i am trying to say is that whenever your real life conditions differ from "normal" you "need to adjust accordingly". In fact this is what is printed below many charts. Too bad not many sources tell you how and what to adjust. While failure to adjust cutting parameters often leads to chatter, poor surface finish and even tool breakage, one of the biggest mistakes people do when machining is trying to compensate for imperfect conditions by reducing spindle speed and feedrate. Believe me there are much better solutions. A long 1/4" dia endmill needs to mill several slots with the deepest one being at 1" deep. Workpiece material is hot rolled a36 mild steel. It is obvious that out endmill will have to stick out at least one inch from the tool holder. It will also need to have longer flute length. Thats it. Right there we have a less than perfect situation: our tool is very long and has long flute length. Additionally we will be making full width cuts that put alot of stress on the tool. What are we going to do? What speed and feed to choose? Naturally we look up the manufacturers charts and it says something like "Slotting at 1xD depth- SFM: 500, Chipload: 0.0015-0.0020". It may also say "these numbers are given as starting point only....blah...blah....not ideal...blah blah.. adjust accordingly". This information is a bit confusing to say the least. It does not even say what to adjust. Naturally many will simply pick the lowest recommended chipload and keep depth the same. Here is a step by step walk-through. Enter diameter of the endmill. We will enter 0.25. At this point all of the input fields will have default values already put in place for you. All you will have to do is change the one that are different in your particular case. Enter new Stickout length. We will have to use 1" stickout as this is the minimum length of the endmill we will have to use. Now DOC (Depth of cut) and WOC (Width of Cut) fields will have default values in them. You know they are default when they are green, green means safe. Since we are going to be slotting check "Slotting/Pocket" check box. But most importantly DOC field will display proper depth of cut for this particular endmill! This recommended depth of cut is what you should use as a starting point. No separate "cut balancer" is required. Everything is done automatically, the way it should be, you change tool paramters and the recommended cut parameters update in real time. This way you can better see how different factors affect depth of cut and feedrate. If any field background color is not green, it means that its value is not what is recommended. To make it default you simply click on the text label that represents it. 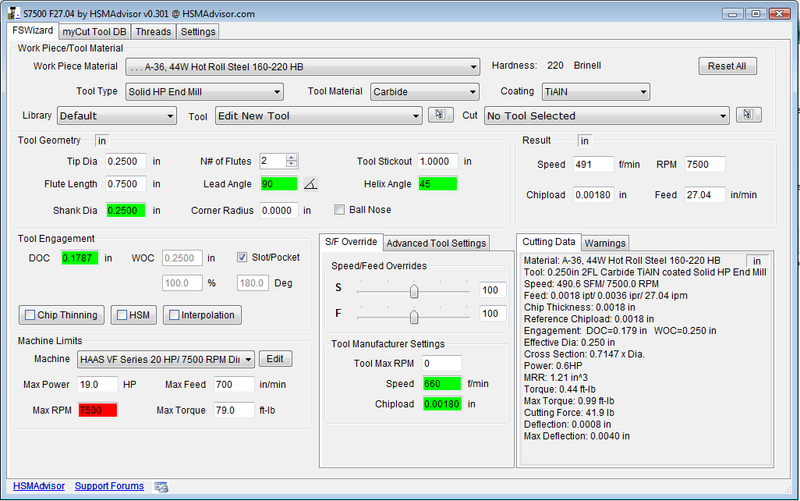 By the way HSMAdvisor will try to keep recommended chipload no matter what length endmill you are using. Instead recommended Depth Of Cut will vary in order to keep endmill within proper deflection range. Chipload and thus feedrate will only change when user insists on using his own depth of cut.